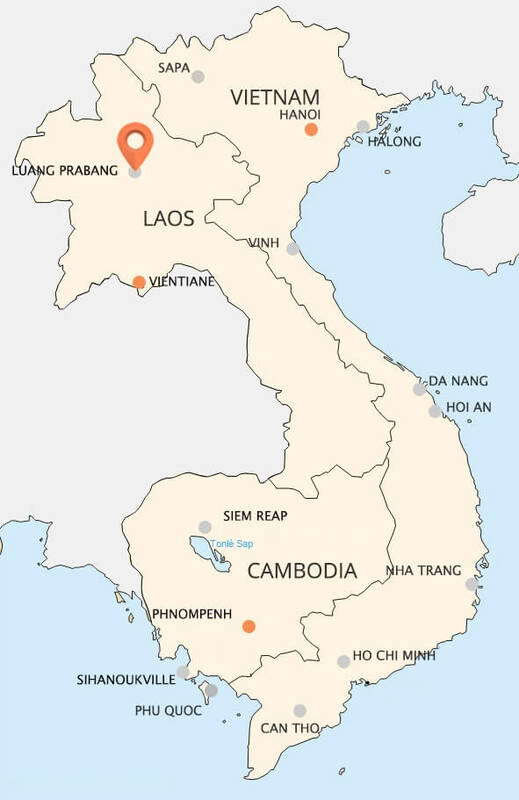 Located about 425 km from Vientiane capital to the north, a small city with an area of 25 ha, gathering of about 22,000 residents among the secluded mountains and forests, the ancient capital Luang Prabang is especially a peaceful tourist destination. Visitors are attracted by the beauty of nature also magnificent historical and religion monuments built from many different feudal dynasties which have cultural and artistic values. Peaceful beauty of daily life here is also the charms of this ancient city. The monks wearing orange robes to beg making a long line through the old streets in the early morning is probably the most characteristic image of Luang Prabang. Every tourists coming here try to get up early just tolook at that idyllic picture. Luang Prabang was known as the center of Buddhism in Laos so there is no strange that this city has the presence of nearly 40 temples, built from different dynasties. Like many other palaces and monuments, temples in Luang Prabang bear characteristic architectures of Laos and mostly preserved largely intact, or restorated and embellished but still preserves the ancient distinction. 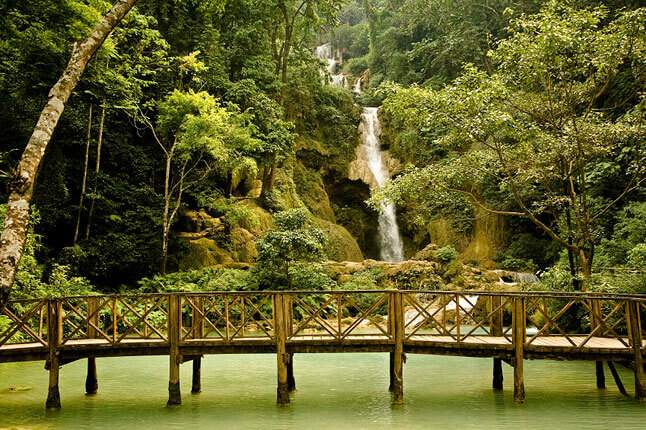 Kuang Si Waterfall, or Tat Kuang Si, is large populations of many small waterfalls in Kuang Si Mountain, located about 29 km from the center of Luang Prabang to the south. The road to this waterfall is very amazing. Paved road with 2 rows of trees in roadside is winding and curved. 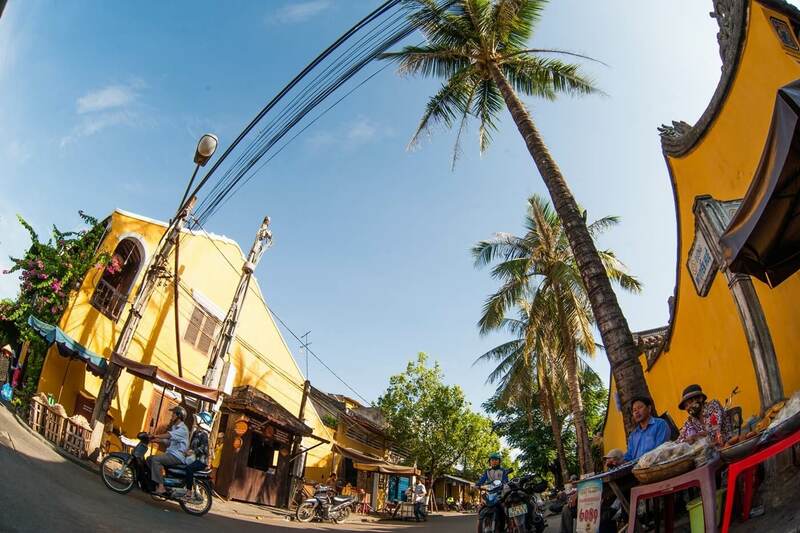 The climate here has fresh air as Tam Dao’s climate, makes tourists incredibly comfortable and relaxing. Tickets are also fairly cheap that you can easily delight in visiting the falls, climbing or bathing in the cool water. Kuang Si Waterfall is surrounded by lush jungles. There are many large and small waterfalls in this area. It is considered the sights being rated as one of the most fascinating sights. When put into operation in tourism, Kuang Si waterfall was built into a very large park with an asphalt road across the falls. The water here is very green because it is derived from upstream and carries an enormous amount of algae. Waterfalls are green throughout the year, mainly due to algae. In dry season, the falls is dried up and not much people come to. But in rainy season, thanks to being supplied a large amount of water from rains, the landscape here is very majestic, attracts many domestic and foreign tourists. Wat Xieng Thong is the most important temple in Luang Prabang. This temple is located at the end of Sakkarin Street, close to the junction of the Mekong and Nam Khan rivers. It was built in 1560 under King Setthathirat Dynasty. This is one of the most beautiful temples of Luang Prabang with Laotian specific architecture: a curved roof falls close to the ground. 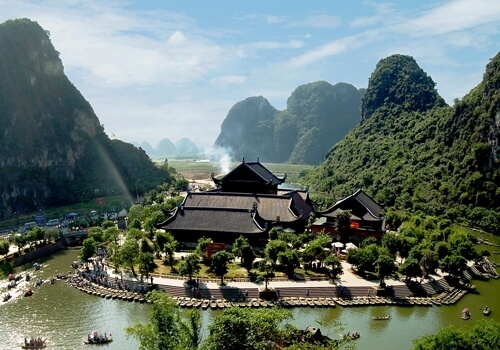 Each year, this place attracts thousands of tourists come to visit. When traveling Laos, to Wat Xieng Thong, guests will find a beautiful landscape with the main temple, surrounded by small shrines with the same architecture. From outside to inside, on the walls there are many ornate and exquisite reliefs, sculptures with content based on the historical references in the life of Buddha. Wat Xieng Thong has a fairly large campus with many large and small temples. 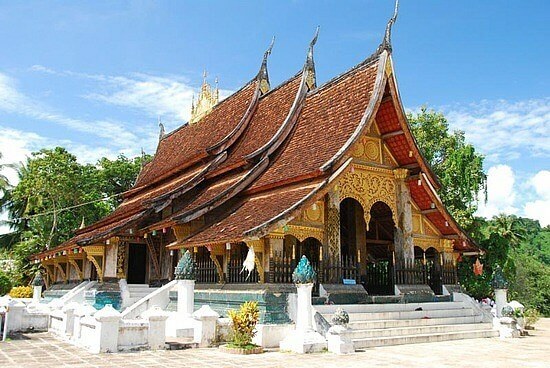 The highlight of this complex is the main temple built follow classic architectural style of LuangPrabang. Beside the main temple, there are many featured construction: Tripitaka Library built in 1828, a hang drum tower built in 1961, a chapel with a statue of Buddha exhibited in Paris Museum in 1931,… They all make tourists astonished by their ancient beauty. Phou Si Mountain, has the panoramic view of the beautiful the ancient capital, is extremely popular mountain with any guests when to Luang Prabang. 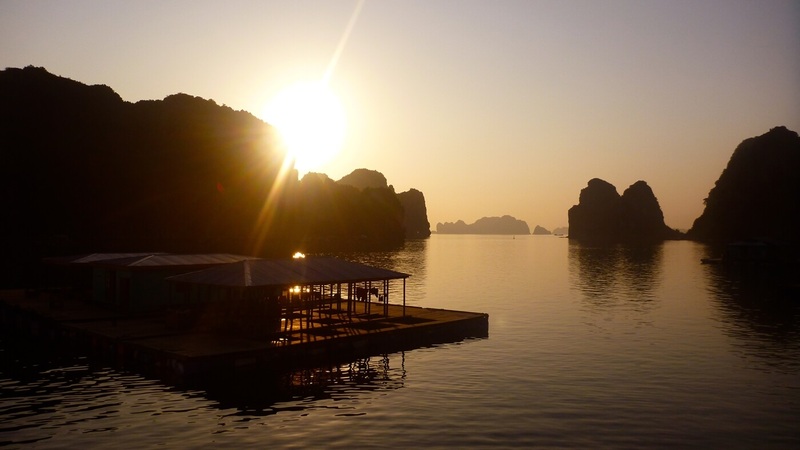 In the Laotian, “Phou” means "mountain" and "Si" means colorful so “Phou Si” means a colorful mountain. 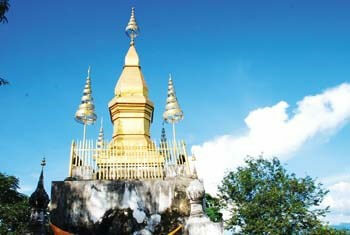 Phou Si is a small hill or mountain with 250m wide, 1000m long and 80m high. On the top of Phou Si is That Chom Si tower with over 20 meters high. To visit the scene of Phou Si, every tourist always have to climb 238 stairs of red brick, cemented, painted white, with few base stations. Both sides of underground stairs section are two dragons flanking, very flexible, with a length of over 10m. Besides, there are hundreds of ancient Champa trees which are over hundred years old. This tower was built in 1804 under King Anourout Dynasty, renovated several times, is the symbolic and cultural, religious center of ancient Luang Prabang. At present, on the campus of Phou Si Mountain remains 5 temples. The panorama of Phou Si is extremely ancient, serenity, hidden among wildflowers. 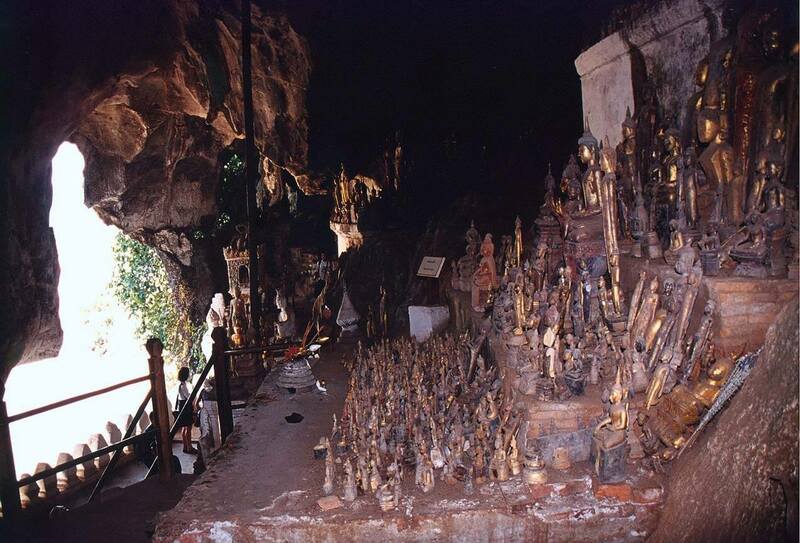 Located near the center of Luang Prabang, Pak Ou Caves long ago became famous tourist attractions of Laos for its uniqueness as well as the historical value and tremendous spiritual significance it contains. Pak Ou Caves include Tham Ting Cave and Them Theung Cave. Pak Ou Caves means caves in Ou estuarine, but the local people still call it Tam Tinh Cave means caves of thousands Buddha. That name came from the amount of Buddha statues in the caves. There are more than 4000 carved statues, from small size as palm to big size as a real person in here. This causes excitement and astonishment for many tourists come here. Most statues here are created with wood, painted red or black. Finally they are coated with gold leaf. There are also some made from animal horn, pottery,... Pak Ou caves had truly appeared long before Buddhism was transmitted to Laos. Along with the theory of animism, from that, the Laotian has expressed admiration for this place by placing the statues here. And slowly the time passed, the number of statues in the cave now has a great amount, and thereby become the spiritual worship of many indigenous peoples. Travelers coming to Pak Ou caves are also plenty of excitement and experiences, but everybody seems to feel the purity of this place. 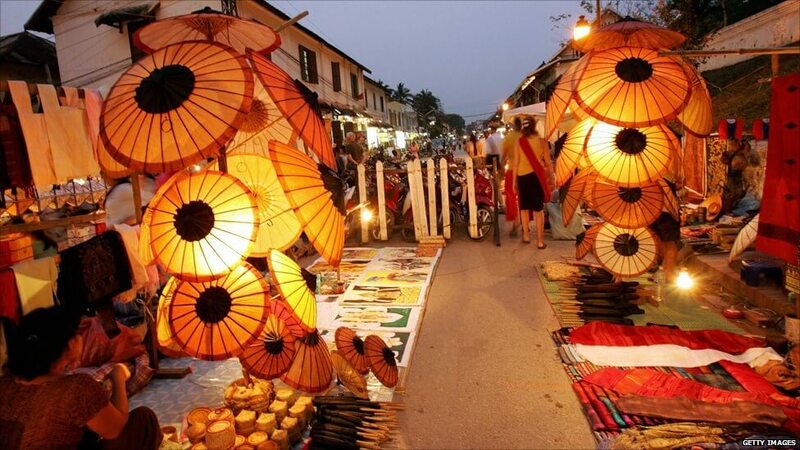 Luang Prabang Night Market is a bustling market, busiest, is the focus of all products of handicrafts from all regions of Laos. This market is opened from 17 pm to 22 pm daily. It is located along Sisavangvong Street, starting from the Royal Palace Museum. In the evening, the road, which stretches over one kilometer, prohibits vehicles passing, become a pedestrian street for shopping and gathering place known as the night market of Luang Prabang. There are many interesting products on display at the night market of Luang Prabang that you can hardly find somewhere else. And especially their prices are very cheap. These sellers offer a relatively low price, so even if you are not good at bargaining, you could still make sure to buy goods cheaply. However, if you like, or simply want to test your ability to negotiate, you can bargain, but do not expect that will be discounted much. Another thing that visitors can easily see when coming to Luang Prabang Night Market there are a lot of T-shirts, paintings,… bearing the symbol of Luang Prabang. Additionally, food and drinks in this market area is extremely plentiful and fascinating. If you want to taste the local cuisine, you can select many items matching your taste, from BBQ chicken to or vegetarian buffet.